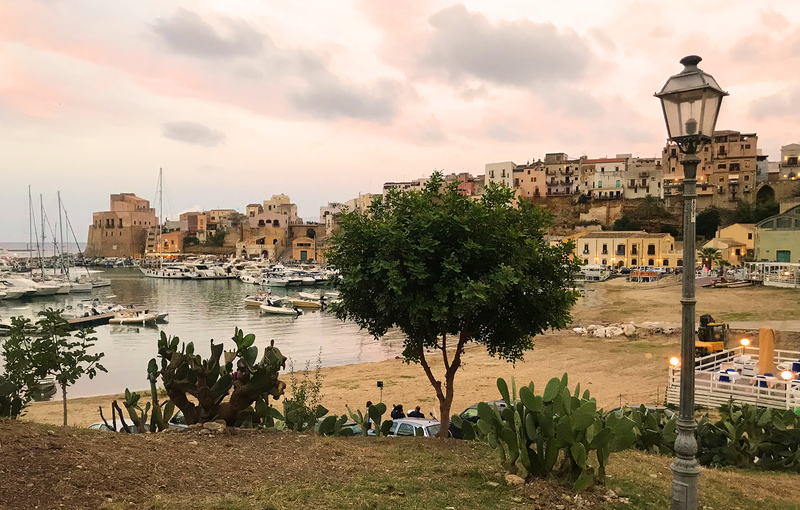 During the second half of our Sicily trip we stayed in a relatively central location on the northwest coast, and since we had a car we were able to venture to various areas for dinner each night. Our first dining experience on this part of the island was in Scopello, a seaside town you may recognize from the movie Ocean’s Twelve. It was a lot smaller than I expected with only a few streets and a rather limited selection of restaurants in its center. We were pretty hungry when we arrived and were drawn through a stone archway on the right, which lead to an atmospheric courtyard dotted with a handful of restaurants. Ristorante Pizzeria Il Baglio was buzzing with almost all of the tables on its large outdoor patio occupied, mostly with what seemed to be (Italian) tourists. 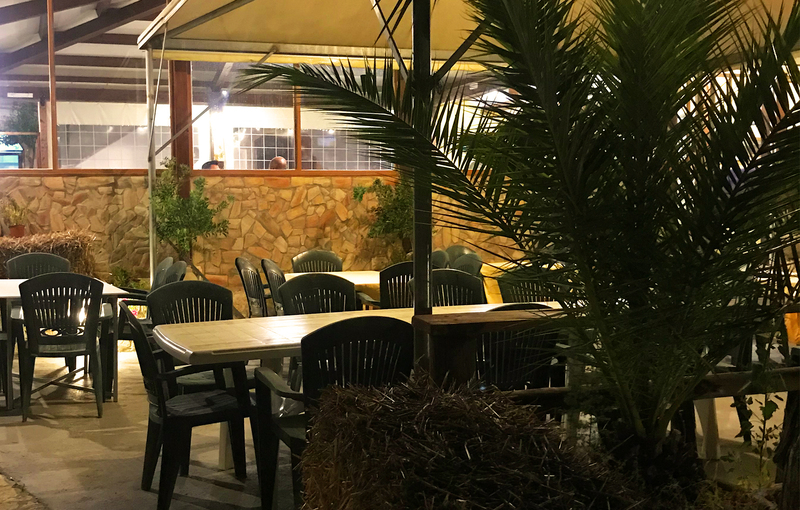 The restaurant’s menu offered a good selection of traditional Sicilian dishes, fresh seafood and wood oven pizza to choose from. We ordered both a frutti di mare and mixed green salad to start, followed by eggplant caponata and a pizza with arugula and cherry tomatoes to share. The food was pretty decent given the location, although you would be hard pressed to find a restaurant that doesn’t cater to the tourist crowd in Scopello. Of particular note was the caponata, which could have been a meal by itself along with crusty bread to soak up all of the wonderful flavors. The service may have suffered a bit because of how busy the restaurant seemed to be, but what was nice was that it did not feel you were being rushed for the sake of turning your table for the next wave of diners. 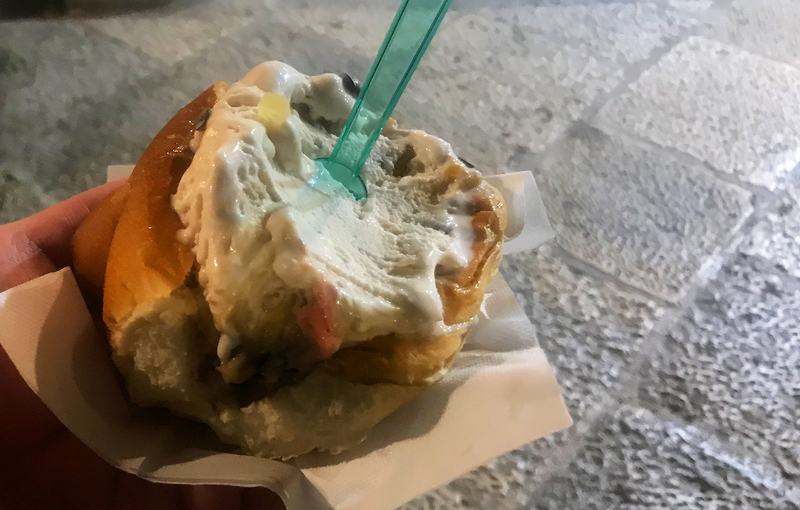 We lingered over our wine and then made our way back to the main piazza on the other side of the stone archway, where we capped off our night at Bar La Palma with espresso and gelato. If you enjoy seafood then you’ll love Castellammare del Golfo. 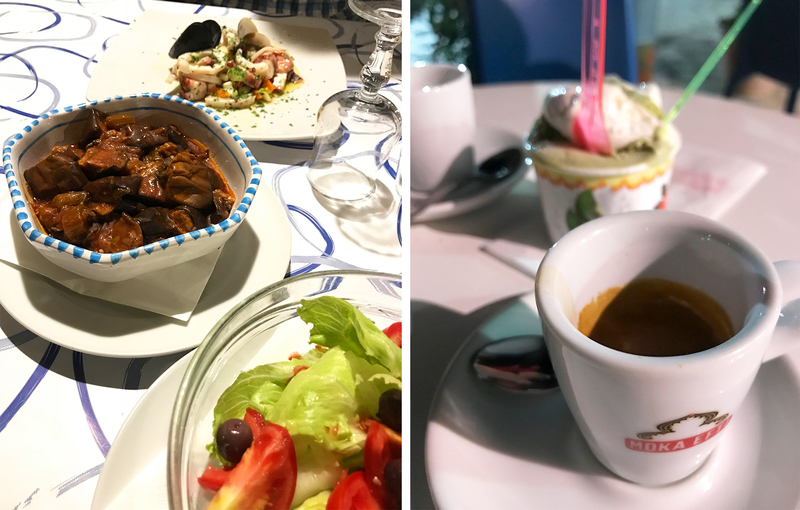 It’s a prime spot for fresh seafood thanks to its location on the coast, with a resort town feel and slightly more upscale dining options than other parts of Sicily we visited. The town itself fans out from the harbor where you’ll find a concentration of restaurants eager to welcome those passing by. We arrived just as the sun was setting, pink clouds creating a picture-perfect backdrop, and had our sights set on a slightly more casual option a little removed from the craziness of the harbor area. Ristorante Pizzeria La Timpa had nice seaside tables along the side of the street with even nicer views as the sun made its final plunge into the sea. The outdoor seating area filled up quickly with even more people waiting for a table by the time we were ready to leave. The menu had a balance of both seafood and traditional Sicilian dishes. We ordered an insalata mista and a seafood antipasti platter with an assortment of items that interestingly enough were served at different temperatures. 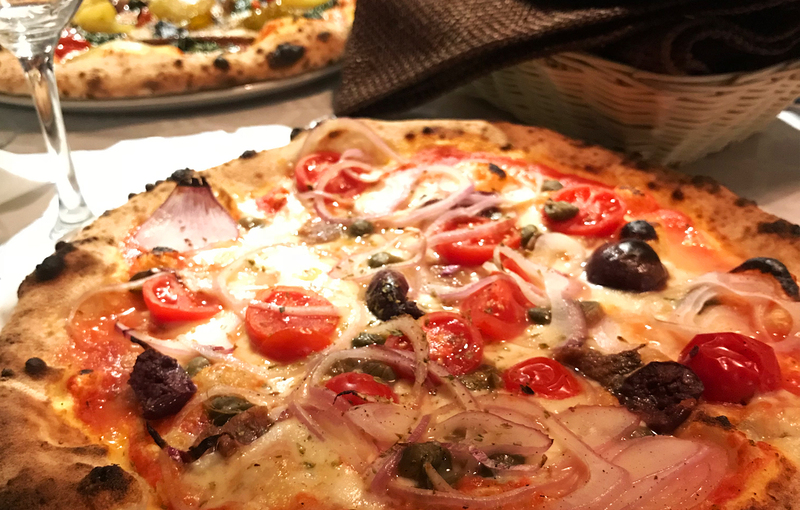 Several people around us were eating amazing-looking pizzas and couldn’t resist ordering two of our own – the Vegetariana with grilled eggplant, zucchini, potatoes, mushrooms and spinach and the Siciliana with tomatoes, olives, red onions and capers. Both were so good that we forced ourselves to finish them and found ourselves in need of a nice long passeggiata afterwards. 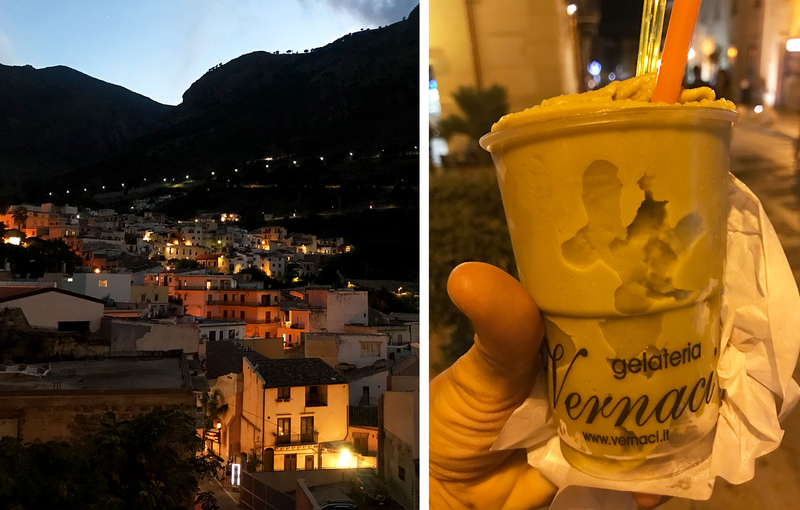 As we made our way up and down the hilly streets of Castellammare del Golfo we had eventually made room for what turned out to be some pretty amazing granita at Gelateria Vernaci near the town center. The long lines stretched far beyond the counter and out the door, and when it was our turn we ordered an almond and a pistachio granite, both of which were smooth and creamy with intense flavors. It was nice to spend the evening in a larger city except for when it came time to go home. We had parked at one of the lots on the outskirts of town and it seemed like everyone else was trying to leave at the same via a small dirt road that had other cars parked on both sides so that two ways of traffic were pitted against each other in a fight for the right of way. We luckily made it out without incident after about an hour, which was enough to discourage us from going back to Castellammare del Golfo another night. We later learned that parking can be chaotic on the weekends in general, so definitely be prepared and plan accordingly. The next night we were at a bit of a loss in terms of where to eat so turned to Google Maps. After exploring the area around us we stumbled across Ristorante Pizzeria Baida about a 15 minute drive from where we were staying. It was literally in the middle of nowhere, at the top of a hill via a series of sharp switchbacks in the dark. We parked in a lot around the side and made our way to the rustic stone patio. It looked as if the restaurant was family-run with multiple generations gathered in the front on plastic patio chairs, only breaking away from their conversation to seat guests as they arrived, take orders and deliver food. It was the perfect laid back setting that we had hoped to find. Once again we ordered too much food and would have been more than content with just the gorgeous antipasti platter we had seen in photos and mentioned in online reviews. 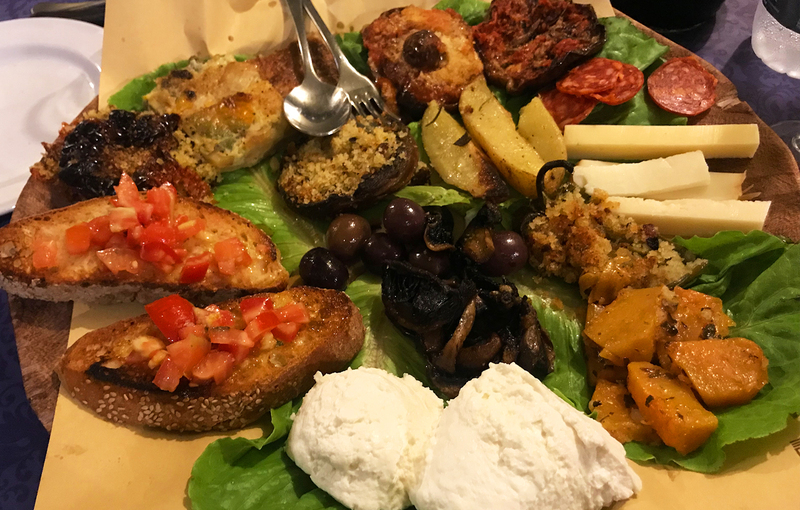 We should have guessed by its price that it would be quite large with an assortment of Sicilian specialties – salami, cheeses, bruschetta, olives, eggplant, mushrooms, potatoes and more – which could have served as meal in and of itself with bread and wine. But we didn’t stop there, and had already ordered a grilled steak and buisiate pasta with sausage, eggplant, tomatoes and mushrooms. It was too much to finish so we didn’t attempt to try (something we rarely do) because we really wanted to coffee and dessert. 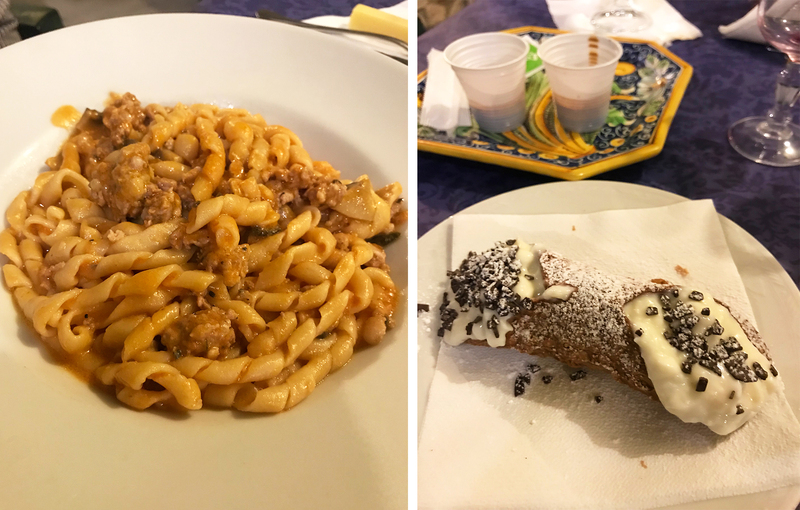 We split a cannolo, which had light and creamy filling and a more pronounced ricotta taste than other cannoli we had tried in Sicily, and just the right amount of sweetness. 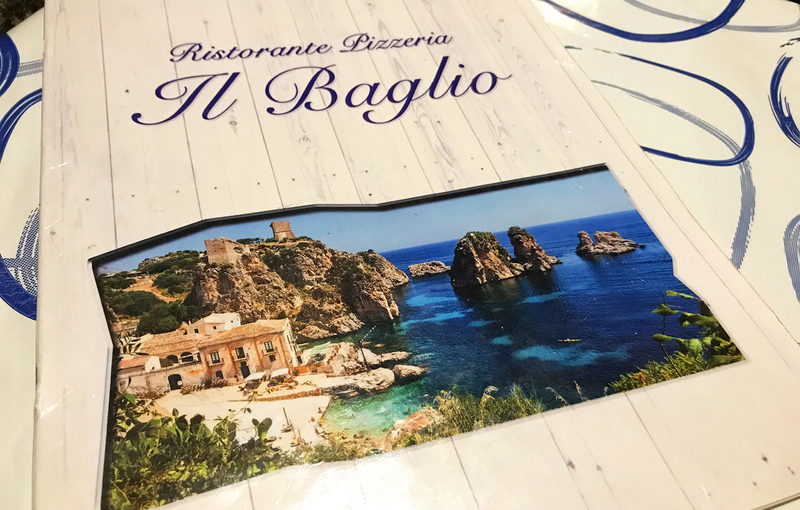 We spent our last day in Sicily on the Egadi Islands and were looking for a quick and easy meal before our drive home from Trapani. After walking around the city center we settled into Sorsi e Morsi along the main pedestrian street Via Corso Vittorio Emanuele. 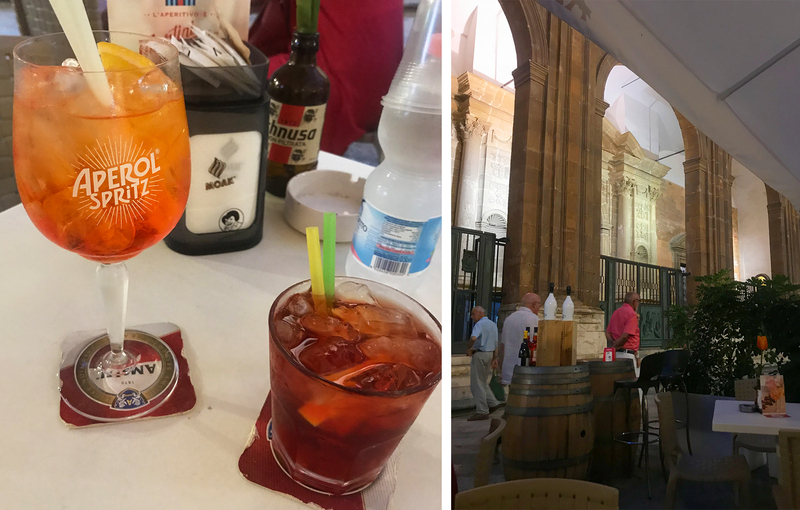 This casual wine bar is situated directly across from the San Lorenzo cathedral and seemed to attract a mixture of local “regulars” and tourists alike. 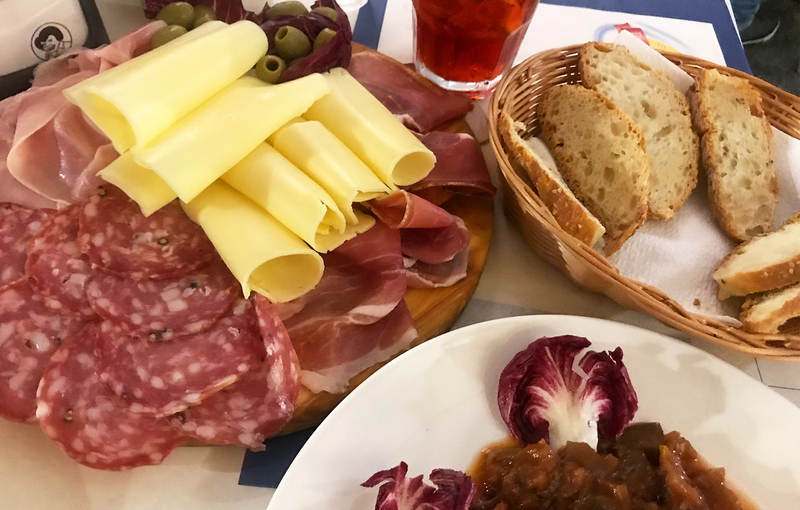 We started with a much-needed aperitivo (an Aperol Spritz and a Negroni) followed by the antipasti platter that was advertised on the street side menu board. Our “light” meal turned out to be a gigantic party-sized tray that included 3 types of meat, cheese and olives, which along with the eggplant caponata we ordered, felt like enough food to feed a small army (or at least 6 more people). For more Sicily EATS click here. The food looks delicious, hope to visit Sicily before too long! The food is some of the most flavorful I’ve tasted! Such a different experience from some of the bigger cities in mainland Italy.